In 1973, former Saints head coach John North, who just passed away at 89 in his retirement home in Mandeville, basically inherited a mess. The Saints had not yet steered away from their early legacy of not properly building a team through the college player draft, instead mortgaging their future by banking on veterans whose names and reputations overshadowed their production. In that year’s season opener, the Saints were drubbed by rival Atlanta, 62-7. The next year, North joined Roberts’ staff as a Saints assistant before eventually being promoted. If you can’t beat ‘em, join ‘em. North’s apex as head coach with the team may have been later in ‘73, when the Saints held star O.J. Simpson to a meager 73 yards while The Juice was having a record breaking season, in a 13-0 upset of the Bills in Tulane Stadium. His first two squads finished only 5-9, but at the time it tied for the best in franchise history. How times have changed. North was let go midway through the ’75 season. Sean Tennison, who works in my office, shared some memories of his grandfather, of whom he was quite fond. After leaving the Saints, North spent several years as an assistant with the Falcons, and one with the New Orleans Breakers of the USFL. 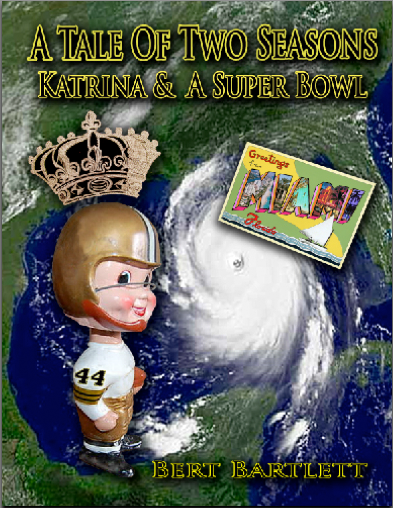 From his Saints days, he was well known and liked by Superdome personnel upon his return. He became a real estate agent on the Northshore after football. As long as he was able, he stayed fit. He golfed, and he would often see Dale Stram, son of former Kansas City and New Orleans coach Hank Stram, who also settled here, at the gym. North lost his wife several years ago. After his freshman year at Vanderbilt, where folklore has it he was fast enough to punt the ball and then run down the field to catch it before it hit the ground, North became a Marine in World War II, rising to Sergeant. He was shot in the leg on the Island of Tinian and was awarded a Purple Heart. North did not discuss his experience as a veteran with much detail, though he kept his Purple Heart open, and prominently displayed in his home. The more people I have talked to about it, apparently veterans of the Second World War are predominantly a discrete fraternity. My father served along supply and railroad lines in Italy, and most all he remarked to me about it was, after a shake of the head, “war is a terrible thing”. A friend of mine in downtown Covington just relayed that as an adult he had to wine and dine his dad at Antoine’s to finally get some of the gist. Veterans have certainly earned the right to remain silent. Posted in Pro Football, Uncategorized.Tagged Hank Stram, J.D. Roberts, John North, New Orleans Breakers, New Orleans Saints, NFL, O.J. Simpson, Pro Football, Purple Heart, Tom Dempsey, Tulane Stadium, USFL, Vanderbilt University, World War II.